Does Flightbuddy handle multi-leg flights? Can I send manual campaigns to multiple flights or routes? Yes, using the manual search function users can enter lists of PNRs, flights or select by date to create contact lists. These lists can then be associated with a communications template and issued manually or scheduled for later delivery. How do I personalise and localise email content? Using flightbuddy’s dynamic links feature you can create email templates where the images and links are varied according to the destination of the passenger. Particularly useful for including ancillary revenues content in the context of service alerts. Does flightbuddy handle multiple languages? Yes, the system allows you to create and store a library of templates for both SMS and email in multiple languages. The passenger receives communications in the language they booked their flight through. Can I combine flight status and booking record merge fields in an email? Yes, there is a comprehensive list of merge fields for passenger profile, itinerary and flight details including flight departure and arrival details in local time. Where can I get maximum benefit from the use of Dashboards? 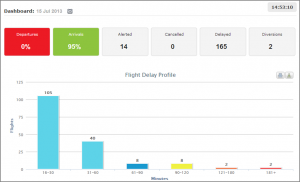 The dashboard is designed to provide customer service and flight ops teams with a visual representation of how the day is progressing regarding punctuality, delay types and the delay profile for all aircraft movements on that day. It can be displayed on a large screen in the ops room or on hand held tablets. There is a web URL that can be made available for remote viewing. 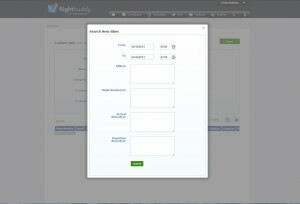 Does flightbuddy integrate with my Booking system? Currently flightbuddy is fully integrated with Newskies (Navitare). We are reviewing Amadeus with the intention of connecting via their API and will add additional integration options as required. How is flightbuddy charged for? Flightbuddy is a pay as you use cloud service. We charge a monthly service fee that covers software and support, a additional cost per SMS issued is based on volume per month. How do flight status changes generate alerts? The Fight Notifier module in the system is monitoring the flight information data for changes in flight status and identifying events that may require alerting. A set of rules set in each automated campaign determine if and when an alert should issue. Where does the flightbuddy application reside? The application software and your dedicated database instance reside on our private ultra secure servers in a Tier 2 datacenter. A second instance of the system is retained on ther Amazon cloud to provide Business Continuity in the event of a failure in the main production facility. Do I need to install any client software on my systems? No, The system is fully accessible through any web browser (excluding IE7 or below). How do I retrieve alerts that have issued? A copy of every SMS and email issued to a passenger is archived in the system, using the search function you can retrieve the communications to individual passengers to assist in responding to complaints or civil aviation authorities. How do I alert station managers of delays and cancellations? You set up and manage a station alert list which allows you to selectively issue SMS or emails for specific flight events, delays, diversions, air turnbacks or cancellations. Is the SMS delivery service global? Yes, flightbuddy uses two separate SMS providers to deliver globally, provide resilience and ensure the lowest available delivery cost per country. Each flightbuddy client has a dedicated database, all communications is SSL encrypted and connectivity is locked down by IP address. The production environment resides on a PCI certified private cloud offering third party audit confirmed security. Each client database is backup daily. Can I search the archives for individual alerts? Yes, using PNR, phone number or email you can search the communications logs or the contact lists and bring back the audit trail of alerts. Clients raise support tickets through the Flightbuddy clinet portal, these are relayed to the support team and cleared according to the priority setting. In addition Flightbuddy can provide manned telephone support from 05:00 GMT to 20:00 GMT 7 days a week.